Welcome to edition 48 of the Railwaymedia blog. It's been over a month since the last posting but school holidays aren't really the best time to try to find a couple of hours to sit down undisturbed to write this waffle! I've had a few trips out photographing over this time and have also been doing a bit of work on my website. Whilst I am reprocessing and captioning all my pictures you will find some pictures in this blog, and indeed on the front of folders on my photo galleries will be missing. It will probably take me a few weeks to do the locomotive section alone. My first outing of August was not so much a photographic jaunt as it was a visit to the excellent Egham Beer Festival which is held three times a year at the United Services Club. It is easily accessible being only a 10 minute walk from Egham Railway Station, served by the half-hourly London Waterloo to Reading service and always hosts an incredible selection of beers both on the bar and in the rear courtyard. The next one is being held between the 7th and 10th of November. I went by the way of Reading and stopped off at Wokingham and Bracknell, the latter place appearing to have no redeeming features whatsoever. I'm sure there may well be some nice bits of the town (though maybe not judging by this website) but I'm afraid the centre itself is a classic 1960s concrete monstrosity which apparently is due, not before time, to be regenerated. Two days later and I was back down south for a rare Saturday visit to London. I don't usually go anywhere on a Saturday, mainly due to football, but I was promised that there were no premiership games playing so I took the chance that I would avoid any hoards of supporters on trains. 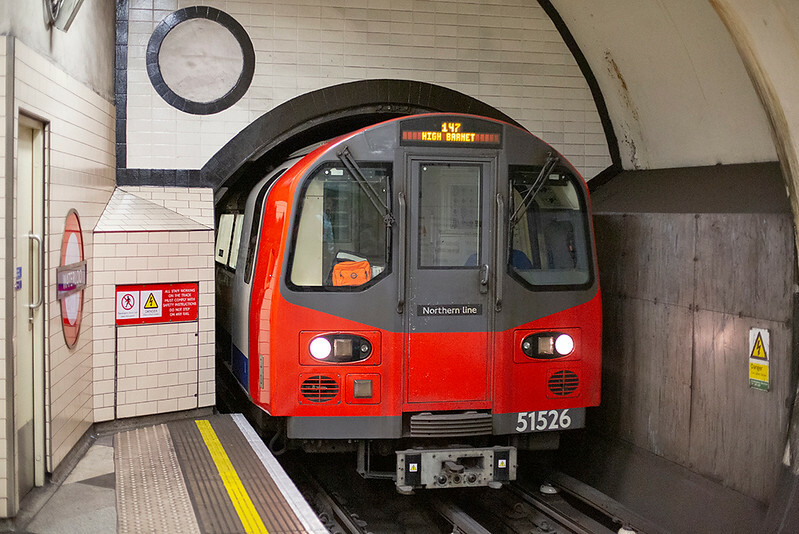 My main aim was to get some pictures of Underground stock on the Hammersmith & City and Piccadilly lines. 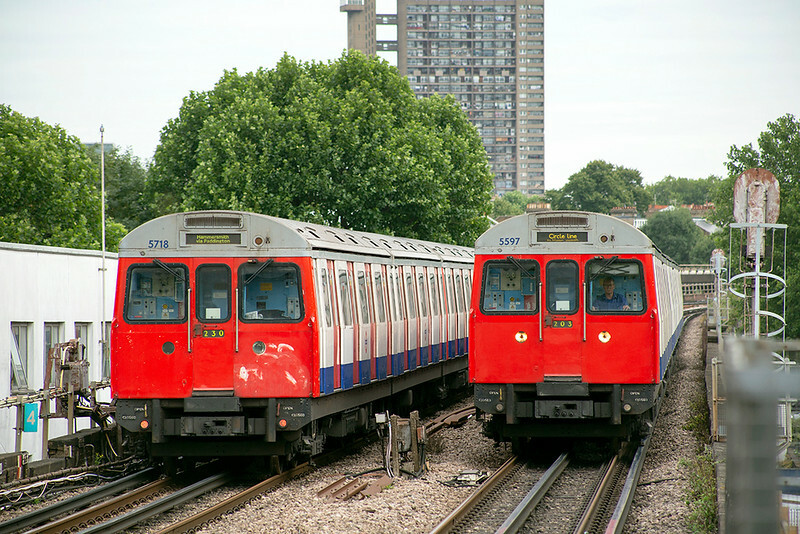 The C Stock that is used on the Circle Line and Hammersmith trains is due to be replaced shortly by the new Bombardier S7 Stock, the same as has been recently introduced on the Metropolitan Line but one coach shorter. 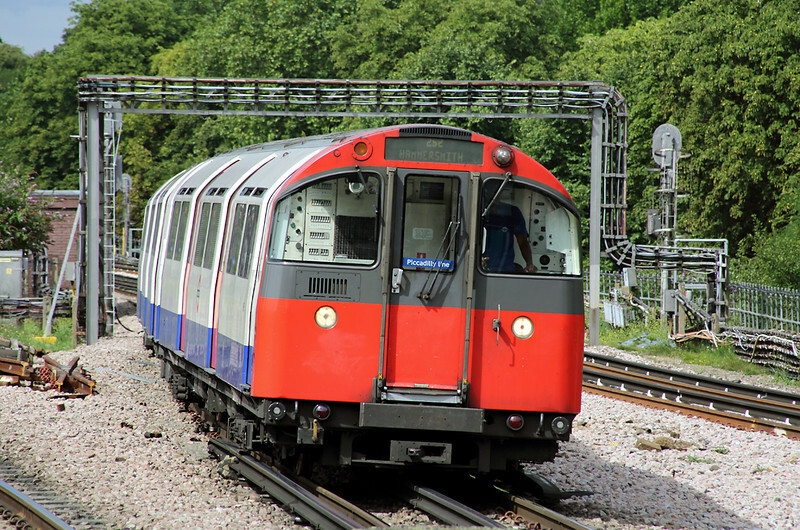 Following thew withdrawal of the A Stock on the Metropolitan these are now the oldest trains in use on the London Underground. The Piccadilly I had not covered particularly before so I spent an hour on the four track section between Hammersmith and Acton Town where the Piccadilly and District lines operate in parallel, unusually the small tube trains run non-stop whilst the full size District D Stock provides the stopping service due to the need to speed up the Piccadilly trains as they serve Heathrow. After a morning photographing the tube I paid a quick visit to Holloway Bus Garage where there was a charity open day being held and then it was beer time whilst my friend went to watch Leyton Orient play. As he was heading east it was rude not to join him for a beer after the match in the William IV pub at Leyton. Prices have gone up to a massive £2.35 a pint for their home brewed Brodie's beers. Anyone who knows how much a pint normally is in London will realise how cheap that is. Food is reasonably priced too. Another place I would recommend visiting! 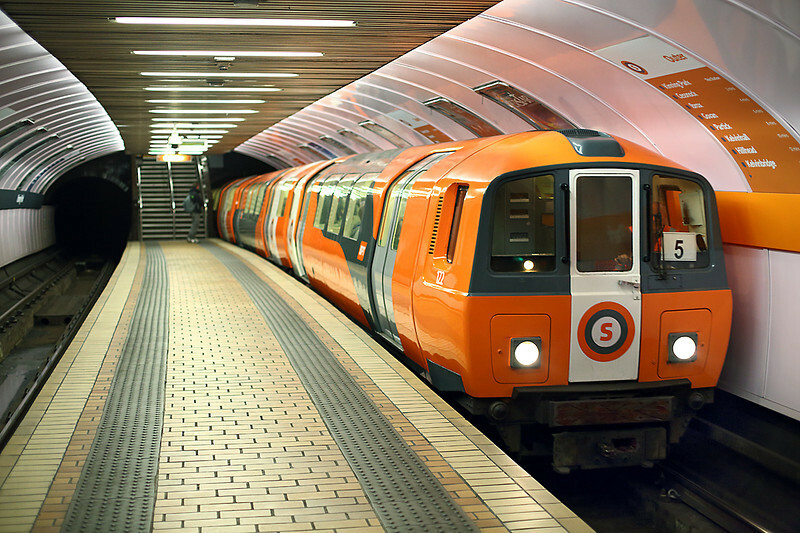 I had an hour and a half in Glasgow with work one day a week or so later so decided to visit the Glasgow Subway (colloquially known as the Clockwork Orange). I have not been down there for a few years and in the meantime the trains have been repainted. It was also a good opportunity to test out my new Canon 5D in low light conditions. I used 1600 ISO for most of the pictures and there was little noise at all on any of them, certainly far less than on my 20D. Two pictures here to show the difference, both at 1600, the first on the 5D with no noise reduction and the second from my 20D which needed the use of Neat Image to reduce the noise levels on the darker areas. A new photo location for me a couple of days after that was at Burton on Trent. 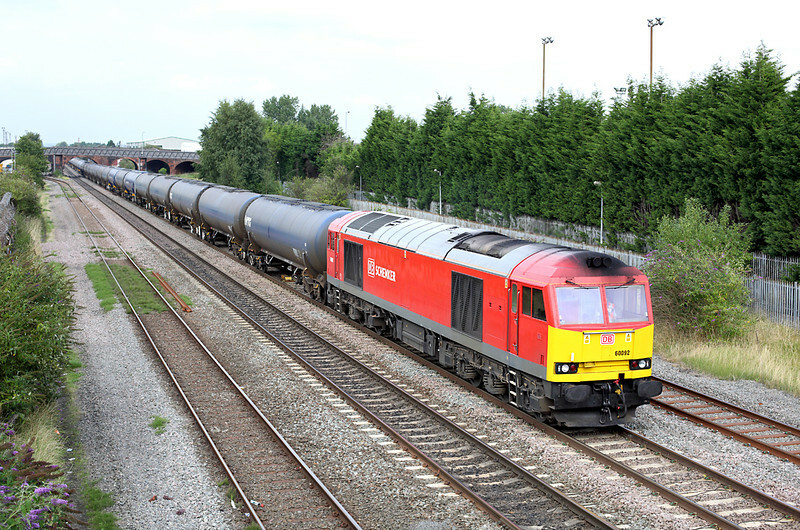 The line between Derby and Birmingham is one of the countries busiest for freight and I have visited locations such as Elford, Water Orton and North Stafford Junction before. There is a convenient footbridge just to the east of Burton station and during a period of slightly over one hour in the afternoon 6 freight trains and the Network Rail HST went past in addition to the usual class 170s and Voyagers, although the 56 was a bonus as it had been diverted from its usual route to Boston via Nuneaton. I went home via Rugeley and, had I realised earlier, I might have spent the whole day on the line from there to Walsall as it was the last day before the line shut over the bank holiday weekend for resignalling and the closure of the signal boxes at Rugeley (Brereton Sidings), Hednesford, Bloxwich and Walsall. 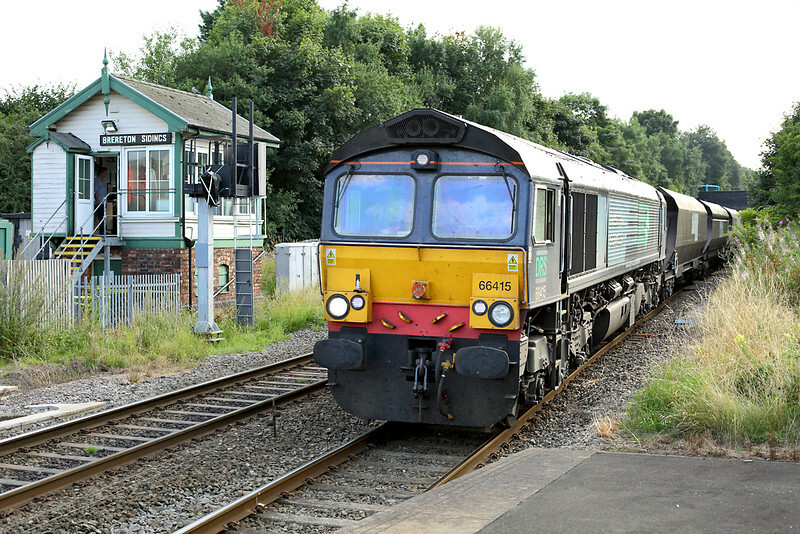 I was fortunate as there was a coal train approaching just as I stepped off the local train at Rugeley Town station. Not the best angle for a photograph but worth the shot including the signal box for posterity on its last day of operation after 105 years in use. 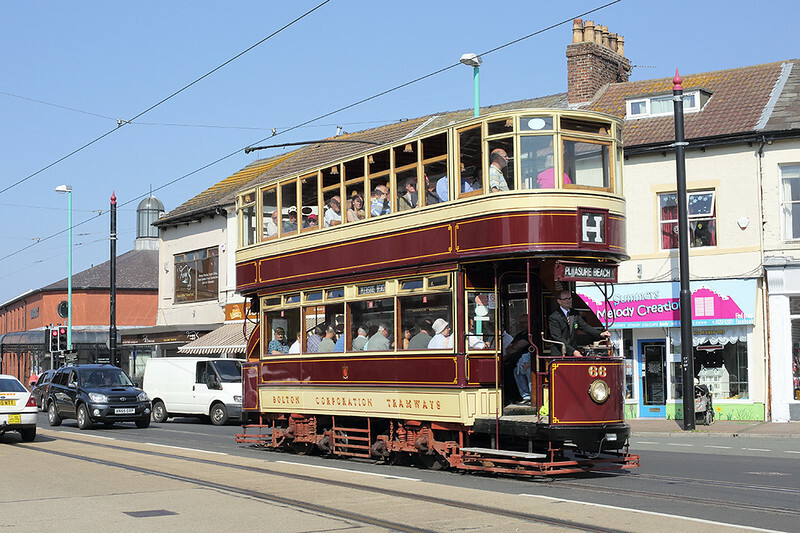 The Bank Holiday weekend also saw what was billed as the last day that the Blackpool Tramway's heritage fleet would be in operation during daylight in 2013. For the rest of the year they will see use during the illuminations though of course only after it has gone dark. I went over on the monday to have a ride on them. 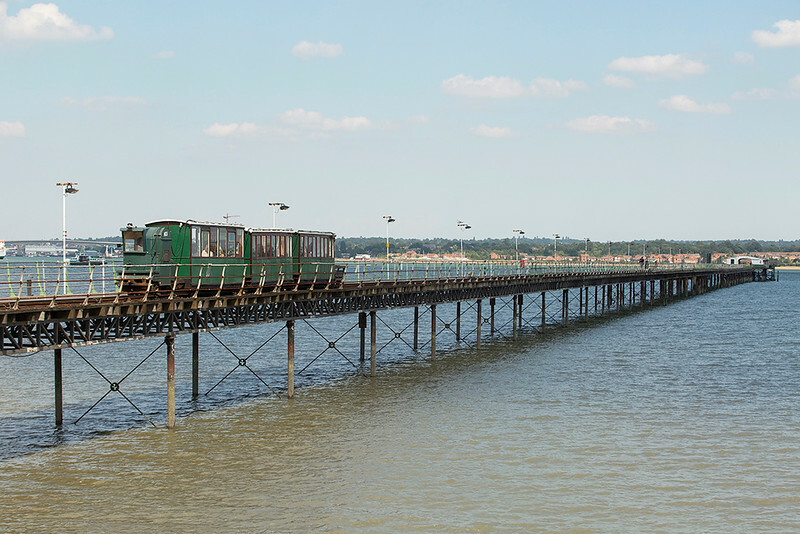 A 'Heritage' day ticket is £10, though also covers you on all other trams and buses, which is just as well unless you are simply going to do round trips from the North Pier or from the Pleasure Beach where the heritage fleet were starting and finishing. 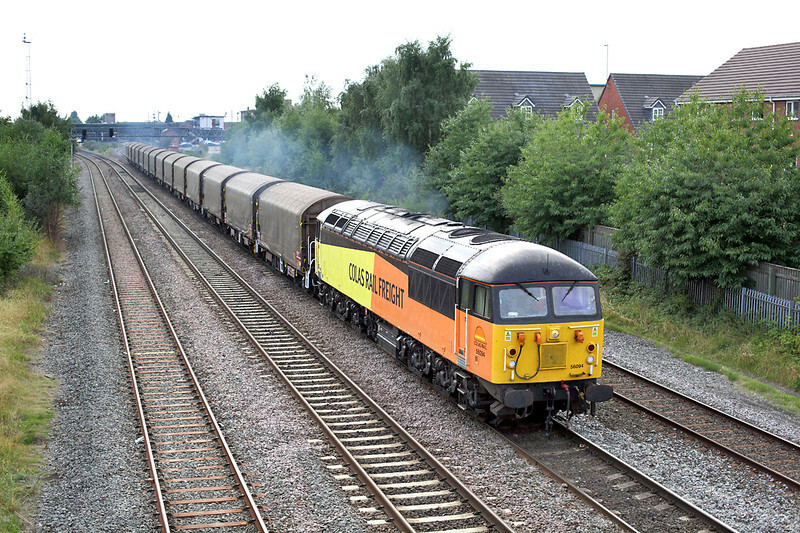 There was no timetable as such for the heritage fleet aside from three booked trips to Fleetwood. Due to the lovely weather the open top 'boats' 602 and 604 (now renumbered to their original numbers of 227 and 230) were mainly running between Pleasure Beach and North Pier and were carrying healthy numbers of tourists. The other trams were doing trips further afield to Bispham or Cleveleys, though oddly none seemed to go there between the afternoon and evening Fleetwood trips. Quite a few enthusiasts were waiting in vain for one to appear at Bispham. Some form of basic timetable is needed for this service, even if it is just for one tram with the others operating on demand. The following day I was free to make a longer trip somewhere. I had thought about going to Newcastle to get some Tyne and Wear Metro pictures, in between visiting branches of Wetherspoons, however the weather forecast dictated the south would be a better option so I plumped for a visit to a small railway that has been on my 'to do' list for some time, namely the Hythe Pier Railway. Built in 1909 and electrified in 1922, there are two locos, four coaches and two trucks, one being a four wheel flat truck for carrying baggage and buggies, the other being a fuel tanker for supplying the companies two ferries. The locos are probably the oldest engines in daily service in Britain dating from 1917 when they were built as battery locos to operate in a mustard gas factory, converted to electric third rail engines in 1922 when they were bought for the pier railway. 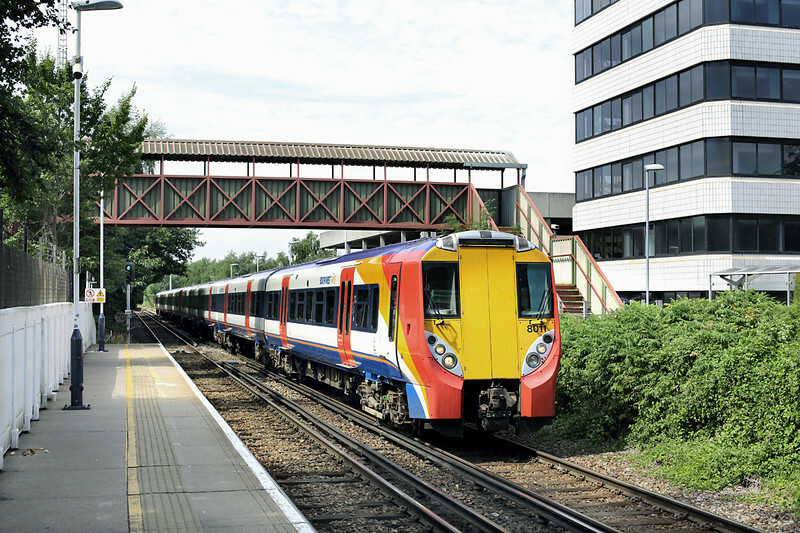 The line operates a 30 minute service to connect with the ferry from Southampton. 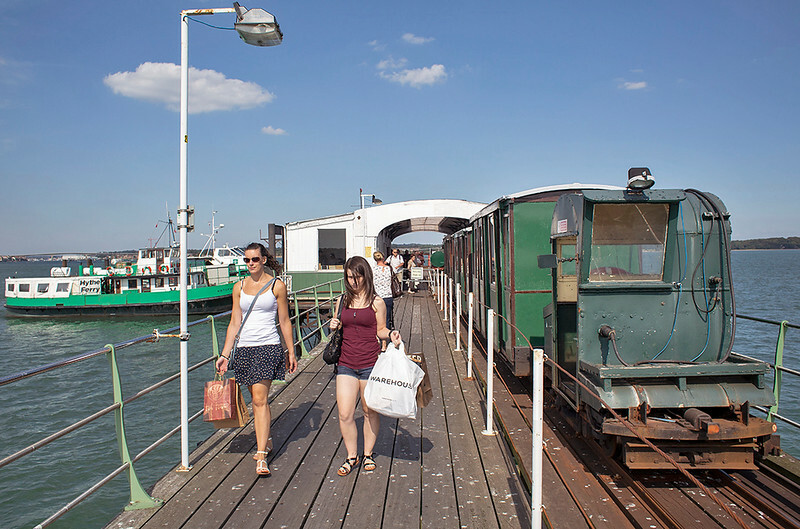 The bus from there to Hythe takes about an hour so the train and ferry are a popular way for tourists and commuters to get between the two towns, the entire journey taking about 15 minutes. Currently a return from Southampton on the ferry is £5.50 with the train being free to ferry users. There is a pub and shops by the station and a nice small seafront where you can sit and watch, or photograph, the train. Rather than my usual rush across London to grab an overpriced beer in either the Euston Tap or the nearby Bree Louise pub before my train home, I once again thought I would try and test out my 5D on the Underground, the Northern Line being another that I only had a couple of pictures from. For most of the shots I again used 1600 ISO, but forced by the platform at Waterloo being busy to trying a picture of one entering the station at speed, I needed to use 3200 ISO for one shot. Again there was very little noise apparent on the image. The station was well lit but, even so, being able to take a photograph at 1/640 of a second underground with good results is pretty amazing. That is it for my August wanderings. As yet I haven't had chance to go anywhere this month, though I do have my first trip to Italy booked for a few weeks time. I hope then to get some pictures of the Italian D445 class of diesel loco which I understand are being phased out over the next year or two, amongst other pictures of course. All will hopefully be revealed in blog number 49. I'll leave you with a picture of a rather unexpected find in Edinburgh whilst I was out having a bit of a stroll. 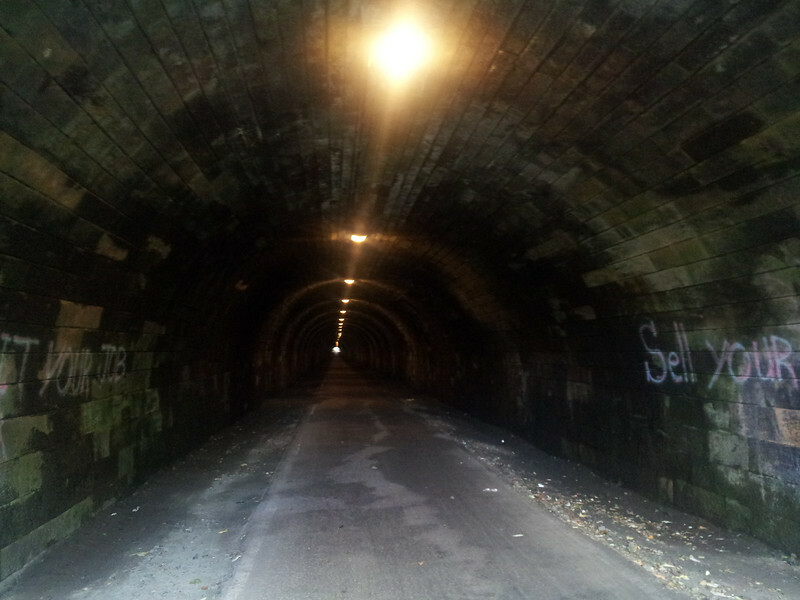 It is now a cycleway but this tunnel formed part of the Edinburgh and Dalkeith Railway and led to the terminus at St Leonards. 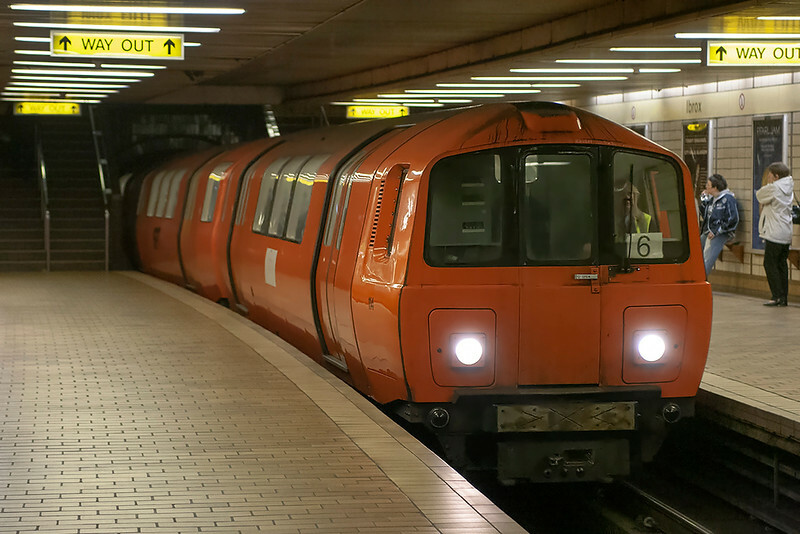 Originally built for coal it started being used for passengers after only a year, St Leonards becoming Edinburgh's first railway station, indeed the 566 yard long tunnel under the western flank of Arthur's Seat is the thought to be the first railway tunnel to be built in Scotland. There is little to be seen of the old station, the site now being a housing development, but the tunnel and trackbed to the south can still be walked along for about 2 miles to the point where it used to meet up with what is now the Edinburgh Suburban line round the southern outskirts of the city near Brunstane; it is well worth a look. Thanks as always for reading, bye for now!